By Laura Ishizaka & Deb Ripley, Palos Verdes Library District, Rolling Hills Estates, Calif.
We don’t know about you, but just the phrase “needs assessment” can be overwhelming, bringing to mind community-wide surveys, focus groups, forums, consultants. But does a needs assessment need to be that large and complicated? We say no. We wanted to offer programs to our senior community based on what we heard and saw in our library and the community at large. We looked at the most recent census data available and confirmed what we saw in the library — according to 2015 US Housing and Demographic estimates, approximately 40 percent of the population served by the Palos Verdes Library District (PVLD) is aged 55 and over. From our observations, we knew that older patrons came in to read daily newspapers, check out audiobooks and watch movies at our film programs. But we needed to know more, so we asked — in casual conversations with patrons, as well as some paper surveys — what they wanted and needed from their library. We listened as they voiced concerns about other local community issues. We asked about people they knew who didn’t come to the library and why. We talked to our parents and grandparents to find out what they were missing in their community libraries. We listened to anyone who would talk to us and took note of these interactions until we felt like there was something there — a need that we could address as the library. Once we had an idea forming of the kinds of programs, information and services that would be helpful to our senior community, we checked out what was going on in the senior world on a bigger scale. We read the Pew Research Center’s reports on libraries and AARP and ALA publications, and we attended senior group meetings in the area. Learning about resources already offered to seniors and their areas of interest helped shape our focus, giving us more insight into where there were gaps in services to seniors. We narrowed our areas of interest to mirror those that AARP declared as a way to “disrupt aging”— self, wealth and health. There is another specific need in our community: the Palos Verdes Peninsula is geographically isolated and isn’t very walkable. This is the price we pay for having epic natural beauty all around, but having such a beautiful, hilly locale makes driving tricky, especially at night. If you’re older, that means you’re probably not getting to a library branch that’s hosting wonderful events and maybe not even venturing out of your home often. And that leads to social isolation. To combat this issue, we wanted to meet our patrons where they were by offering programs in many different locations — which meant reaching out to local organizations (but we’ll cover that in a future post!). Now we were raring to go! We wanted to provide seniors on the Peninsula with myriad opportunities. We planned to offer chair yoga and tai chi classes out in the community; strength training to enhance balance, mobility and fall prevention; financial wellness and education workshops in local assisted living residences; art for anyone programs; teens helping seniors with technology; healthy cooking classes and more. Basically, a smorgasbord of opportunities to enhance their lives. We wanted to ensure that these programs were free and held in safe and familiar places to our seniors to improve accessibility. We wanted to make them fun so our patrons would see these programs as a way to socialize with other like-minded folks and maybe even spark some friendships. We felt like we had a pretty convincing reason to be given all the money! The idea that grew from just listening and observing snowballed into multiple programming areas. Now we needed to find a way to fund these big ideas, because a simple flyer and program announcement wasn’t going to cut it ... not this time. 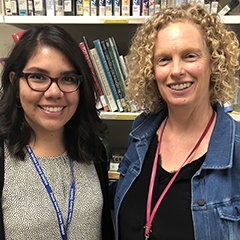 When the Palos Verdes Library District embarked on a major initiative to serve older adults, they knew the first step: a needs assessment.